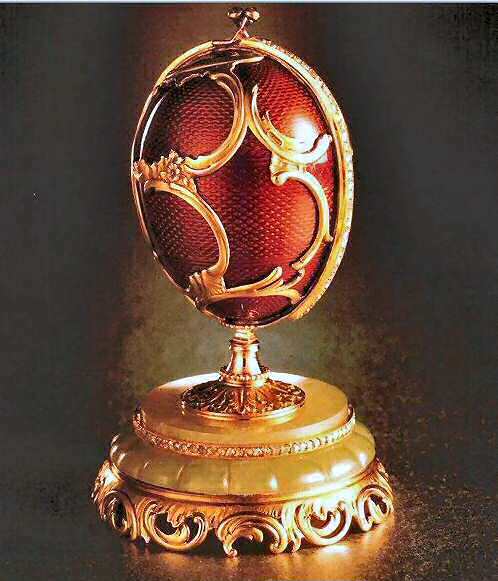 The Spring Flowers Egg is made of varicolored gold, platinum, translucent strawberry red enamel, diamonds, bowenite and satin and velvet lining. The basket surprise is made of platinum, gold, translucent green enamel, diamonds, white chalcedony and demantoid (green) garnets. Enameled translucent strawberry red over a guilloche ground and applied with neo rococo gold scrolls and foliage, the Spring Flowers Egg opens along a vertical diamond-set seam fastening at the top by means of a diamond-set clasp, to reveal a removable diamond-set platinum miniature basket of wood anemones, the flowers with chalcedony petals and demantoid pistils. 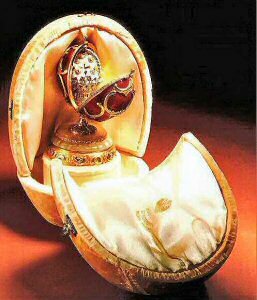 The Egg, the lobed bowenite base with a diamond-set girdle and with a gold rim pierced with neo rococo shell work and scrolls, is marked "Fabergé" in Cyrillic and the assay mark of 56 standard for 14 karat gold, also with scratched inventory number 44374 or possibly 44474. The Spring Flowers Egg, hallmarked with head workmaster Michael Perkhin's "early" mark, is struck with the St. Petersburg's assay mark for before 1899 and appears to bear a scratched number 443 (or 4) 74, which may or may not be Fabergé's inventory number. Its original fitted case is stamped with Fabergé's Imperial Warrant and the addresses of St. Petersburg, Moscow and London. These facts seem to be in apparent contradiction. The hallmark dates the egg to before 1899, the original case to after 1903, after the opening of the London Branch. Inventory numbers do not generally appear on Imperial Eggs. A list of objects dated 14-20 September 1917 transferred from the Dowager Empress's Anchikov Palace to the Kremlin Armory and signed by Major-General Yerechov , mentions a “purse of gilt silver in the form of an egg covered with red enamel, with a sapphire” and, separately, “a basket of flowers with diamonds,” which probably correspond to this egg and its surprise. It was sold by the State firm Antikvariat in charge of the disposals of Russian Imperial treasure, to an unspecified buyer in 1933 for 2,000 rubles ($1,000), later sold by A La Vieille Russie to the Long Island collector Lansdell Christie, and again by the same New York dealers to Malcolm Forbes as an Imperial egg in 1966. It was exhibited as an Imperial Easter egg twice at the Metropolitan Museum in 1961 and 1996 and at the seminal exhibition at the Victoria and Albert Museum in 1977, and, up to 1993 has been published by all leading specialists, including Bainbridge (1949), Snowman (1962, 1963, 1964, 1972), Habsburg (1979, 1987, 1993, 1996), Solodkoff (1979, 1984, 1988, 1995) and Hill (1989) as part of the series of Imperial eggs. Recently, Muntian (1995) and Fabergé/ Proler/Skurlov (1997) have excluded the Spring Flowers Egg from the list of presents made by the last two Tsars. Muntian, based on the 1917 inventory of the Anchikov Palace, now believes that it belonged to the Dowager Empress and assumes that it was presented to her by a relative or close friend. 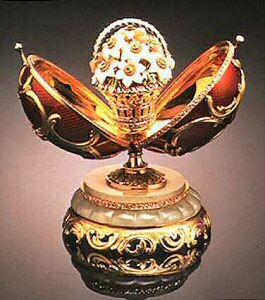 With its decoration of scrolls and rocaille, the Spring Flowers Egg is a typical example of Michael Perkhin's early Neo-Rococo style, probably dating from the late 1880s or early 1890s. This date is borne out by the early form of Perkhin's initials. Inexplicably, the basket of wild anemones in this early Egg is virtually identical to the surprise contained in the 1913 Winter Egg designed by Alma Pihl in 1913. Sold in 1933 to an unknown buyer in Paris. 1961 Owned by Lansdell K. Christie, Long Island, New York. 1965 Owned by estate of the late Lansdell Christie. 1966 A La Vieille Russie negotiated private sale on behalf of Christie estate to the Forbes Magazine Collection, New York. February 2004 sold by the Forbes' family to the Vekselberg Foundation/The Link of Times-Collection, Russia. *Discussion on the Imperial Spring Flowers Egg. One of the Easter eggs bought by Viktor Vekselberg in the spring of 2004 from inheritors of the Forbes fortune, is a counterfeit, according to Valentin Skurlov, Russian expert. Vekselberg's representatives do not doubt the authenticity of the object.